Smartphone manufacturing is apparently becoming more and more of an artisanal affair. First came word about the complex and expensive process required to make those curved screens for Samsung’s Galaxy S6 Edge smartphones. 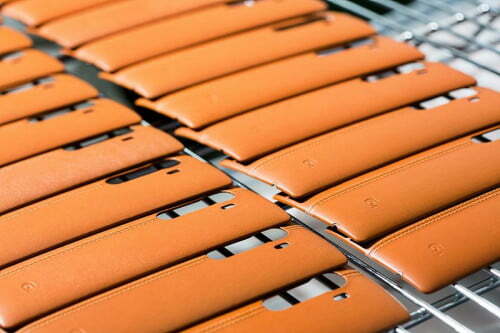 Now LG is saying that the hand-stitched leather backs available for its imminent G4 smartphones take 12 weeks to make. The LG G4 will give consumers the option of having a rear cover made of brown, black, blue, red, cream, or yellow hand-stitched leather. In a post on its site (in Korean), LG sheds some light on the 12-week process it uses to manufacture those leather back covers. The leather LG is using has 0.001-micrometer pores and is meant to feel comfortable in the hand even after extended periods of use, according to the company. That premium leather is put through a core process that takes 10 times longer than the four days it typically takes its competitors to produce a normal rear cover. On top of that process, LG adds hand stitching and coats the leather so the rim of the rear cover won’t unravel. The company also uses a post-processing treatment to improve the rear cover’s resistance to moisture and heat. The driving concept of the LG G4’s leather back is “comfortable elegance,” according to Jun-Ho Cho, president of LG’s mobile communications business division. For consumers, that elegance will undoubtedly cost an uncomfortable price. LG will likely unveil the G4 on April 28 and begin selling the new smartphone in South Korea on April 29. The G4’s expected price is $825, though it’s unclear if that’s with or without a leather back cover. The G4 Note is expected to be a high-end version of the G4 and could feature an all-metal body.